Photo courtesy of The Quikrete Cos. If you've got a structurally sound substrate and a short timetable, a self-leveling overlayment may be your best option for refurbishing an existing floor in either a home or a commercial establishment. From featheredging to multiple layering, today's quick-curing products are mostly used to even out horizontal surfaces, raise floor levels to match new thresholds or breathe new life into old floors without the fuss and expense of tearing up or troweling over. Most resurfaced areas can be open to foot traffic within two to six hours and to electricians, plumbers and other "trade traffic" in a day. Some people say self-leveling concrete and self-leveling toppings are the same thing. Others contend self-leveling concrete is used full-depth while toppings are applied to an existing base. Many divide self-leveling concrete into two categories: underlayments that need some type of covering like carpet or tile, and overlayments that can be covered or decoratively finished as a wear surface. Darius Gross of San Diego-based Life Deck Coating Installations pours Westcoat Specialty Coating Systems’ TC-25 on a living-room floor. The material was used to level the room and was poured between 1/4 inch and 1/2 inch thick. It was hard enough to walk on and stain within a few hours. But all agree with this definition from Ray Kaligian, director of Levelrock business and product development for USG Corp.: "Self-leveling concrete by design is meant to be poured or pumped onto a surface, and the slurry seeks its own level or moves out on its own without a lot of labor on the contractor's end. In contrast, regular concrete typically is designed to have body so it stays in the shape it's poured in." It was hard enough to walk on and stain within a few hours. The floor was stained with Westcoat SC-35 Water-Based Stain and Sealed with EC-11 Water-Based Epoxy and EC-96 Satin Polyurethane Topcoat. 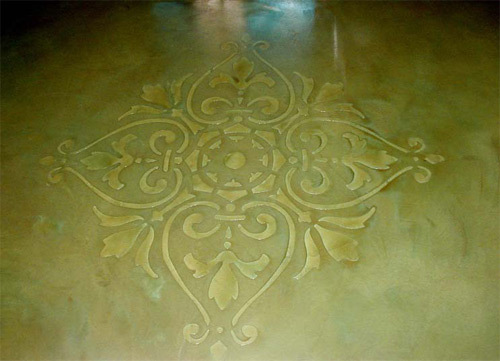 Just like regular concrete, self-leveling overlays can be integrally colored, stained, stenciled, saw-cut, sandblasted or polished. In rare instances, contractors have used dry-shake color and other hardeners with some success. You can use inlays before pouring and you can add glass or aggregate to some mixes. About the only thing you can't do to self-leveling concrete is stamp it. The pattern would simply self-level because it's so fluid. That makes taping designs out of the question, too. One company even makes a self-consolidating countertop mix - Quikrete. Others say that you could use their self-leveling products for countertops, but they acknowledge their mixes were not designed for it. USG Corp.’s Levelrock Proflow is pumped onto a concrete substrate. Photo courtesy of USG Corp. The ingredients in self-leveling products vary widely, says Scott Thome, director of product services for L.M. Scofield Co. Some are made with sand, cement and a binding polymer. Others feature blended cement, gypsum and special modifiers. Still others contain superplasticizers, which give concrete the flowability of a mixture with a much higher water content. "None are really the same," Thome says. "They are designed for the same use, but they don't share the same chemistry." "Superplasticizers can give concrete 8 to 12 inches slump without your adding more water, and they are also used in many overlay products to increase flexibility and ease of spread," says Rich Cofoid, national sales manager for Increte Systems Inc.
Self-leveling overlayments are designed to be thinly applied over existing concrete yet provide a compressive strength of anywhere from 4,000 psi to 8,000 psi when completely cured. Manufacturers agree these products don't behave the way typical concrete does, so there is a learning curve before an applicator is proficient in their use. "Self-leveling is something installers need to be trained for," says Hendrick Goller, director of marketing for Ardex Engineered Cements. "Most installers can't just do it out of the gate." Ardex is among the companies that offer free training seminars to applicators, Goller adds. The company has training centers at its headquarters in Aliquippa, Pa., plus Dallas, Ga., Mansfield, Texas, Anaheim, Calif., Kent, Wash., and Portland, Ore. The Quikrete Cos. makes a fast-setting, self-leveling floor resurfacer that's designed to be poured in strips and doesn't require any mechanical finishing. "It's self-mending," says marketing vice president Frank Owens. "Just pour it in one-foot-wide strips adjacent to each other and it will all blend together." You can use a gauge rake, he adds, but you don't have to. Quikrete also offers a normal-set, self-leveling resurfacer and polymer-modified concrete resurfacer. Although most self-leveling products are designed for indoor use only, the Quikrete floor resurfacer can be used outdoors as well. However, cautions Owens, "It's critical that you block the surface from the wind so it cures at a consistent rate. Otherwise you could get shrinkage cracks." He said Quikrete Concrete Resurfacer is specifically designed for exterior applications. It can be applied with a squeegee. Other companies that make self-leveling products that can be used for interior and exterior applications include CTS Cement Manufacturing Corp. and Ardex. Mapei is currently considering adding one to its offerings. Self-leveling overlayments are primarily designed to adhere to concrete substrates at least 28 days old, but some products are tailored to be used over other materials, including plywood, tile or terrazzo floors. Manufacturers that make the more versatile products recommend securing metal lath reinforcement to the floor first before pouring over wood, while others also suggest using a backer board along with a waterproofing product. 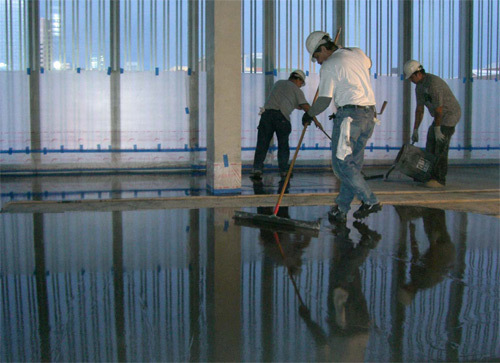 Regardless, the surface needs to be clean - free of oil or other bond-breakers - before a self-leveler is poured. When applying a self-leveler over concrete, the existing concrete typically needs to be profiled by shotblasting, grinding or scarifying. It then should be primed for maximum adhesion and to ensure the leveler's best performance. USG's Levelrock line, however, needs minimal subfloor surface prep, and the base doesn't have to be roughed up in any manner, says Kaligian. "And where most cementitious products shrink when they set up, ours has a minute amount of expansion. It will expand in nooks and crannies on existing floors and lock itself in place." Most applicators use a gauge rake or a spreader to help maintain the consistency of the self-leveling pour, which typically ranges from 1/4 inch to about 1 1/2 inches. It can be deeper but it usually isn't. "Most self-leveling applications are installed at less than an inch thick," Goller says. 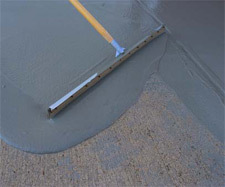 When self-leveling concrete was in its infancy, it was dark gray or chocolate in color and was primarily used to level out a floor before tile or carpet was laid, says Paul Koury, president of Westcoat Specialty Coating Systems. Today, self-leveling products largely come in white or light gray - Westcoat introduced its white TC-25 Self-Leveling Cement at World of Concrete in February. Some companies, such as Ultratex Coatings Ltd. and Increte, also offer premixed integrally colored products. "If it's a large job, we'll preblend the color," says Increte's Cofoid. "If you want integrally colored concrete, we have that capability as well. Just add water." According to Thome, Scofield discontinued its integrally colored product line because the product had to be altered for each new color. "It was a nightmare," he says. He cautions contractors to be careful when integrally coloring a mix, because integral colors dehydrate the mix, some more than others. "Every pigment has a different water demand," he says. "When you're pouring 1/4 to 3/8 inches thick, it's more critical to have fluidity than it is with normal concrete." Also, while the ratio of integral-colored pigment to cement should be the same as with traditional concrete, you will be adding more pigment to self-leveling concrete because the cement content per bag is much higher. "Overlayments have twice the cement content of standard concrete," says Quikrete's Owens. "You may have to find out through trial and error how to make the color you want while getting the material to flow properly." Cofoid says if you're coloring a mix yourself, liquid is the way to go. "The consistency of the color mixed with machines is more accurate." Todd Miller, business manager for Mapei's concrete restoration systems, says his company's high-flow, high-performance overlayment called Ultratop can be integrally colored with powder pigments or liquid colorant. "We have published guidelines to help you with that process," he says, "though there is no replacement for performing a suitable-sized mock-up to ensure the desired results are achieved." The more popular way to color self-leveling overlayments is to use a solvent-based dye or acid stain, Thome says. "Dyes are easy to use on self-leveling toppings because they absorb very well." Increte's self-leveling overlayment, New-Crete, accepts acid stains better than regular concrete, Cofoid says. One of the biggest challenges associated with self-leveling products is that they cost more, says Koury. "And you have to take the time to understand the principals of preparation to get the job done right." Self-leveling materials pose a particular challenge to applicators because they set quickly. "It takes a fast-moving crew to do the job right," he says. "They have maybe only 5 to 10 minutes to tie in each mix before it starts to harden. That's a bit of a challenge. We usually have two people mixing and two people putting down. You have to apply the product wet on wet." 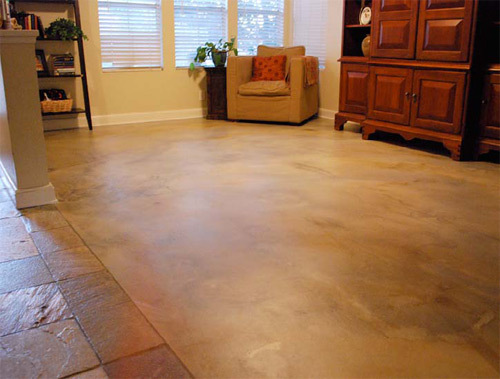 In most cases, concrete made from standard gray portland cement will do the job nicely. But sometimes, especially when a pastel color takes precedence in the overall picture, decorative concrete contractors need to think outside the gray.